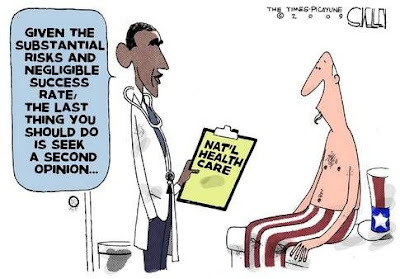 The sad fact is that the Obama-Pelosi-Reid Administration’s 1990 page health care reform bill (HR3962) and supplement(HR3961) violate The Oath by stripping freedom from every person, family and business in Our country . This 19 ½ pound pair of documents, entitled ”Affordable Health Care For Americans Act,” will cost taxpayers over $1.2 Trillion, will institute 13 tax increases totaling $740 Billion, will increase Medicare Premiums to Seniors by $70 Billion, will cost shift $34 Billion to State budgets, and will cut Medicare benefits to Seniors by $426 Billion over ten years. Janda doesn’t mention it, but the overall cost of the bill, which the CBO scored at over $1 trillion over the next ten years, is surely dramatically under estimated. That is because the CBO has to make its report based on the assumptions built into the bill—whether or not they have a shot in the dark of actually coming to pass. This version gives the rationing board, already established through The Stimulus Bill (The Federal Coordinating Council For Comparative Effectiveness Research), additional funding to establish a “Center” to institute the rationing of care. Rationing is the heart and soul of this legislation. Rationing, as a method of “cost cutting,” is the most inhumane and unethical means of health care cost containment. By definition, these bureaucrats will overrule licensed doctors, and preside over the denial of health care. The most glaring difference between the Obama-Pelosi-Reid health care bill from July and this “new” version is the elimination of a very important sentence from the previous bill. The July Bill (HR 3200) provided for The Health Benefits Advisory Committee whose role is to make recommendations on minimum benefit standards and cost sharing standards. The July Bill charged this Committee with the mandate to “ensure that essential benefits coverage does NOT lead to rationing of health care.” The current Bill establishes the same Committee but ELIMINATES the prohibition on rationing care. That’s really key because only a specific anti-rationing directive written into the statute can prevent the bureaucrats from doing the legislators’ dirty business, the points of which are deniability and unaccountability, as in, “I didn’t vote for health care rationing. I had no idea!” But they are if they vote yes to Obamacare, and they do know that it will lead to rationing. In fact, that is their intent. They are just too cynical and anti-democratic to admit it to our faces. There is one problem with Janda’s analysis: Most doctors don’t take the Hippocratic Oath anymore. Indeed, it is being systematically undermined as a fundamental statement of ethical principle in universities and med school bioethics courses, where the doctors of tomorrow are taught utilitarian bioethical principles, to accept dual—and sometimes conflicting, mandates—between their patients and “society,” and the propriety of taking human life in the course and scope of providing medical services based on quality of life judgmentalism.